One of the most used but least known joints in our bodies are the joints that control our jaw. They are known as the Temporomandibular Joints (TMJ). These joints are used daily for speech, swallowing, breathing and eating. When they are in dysfunction any one of these activities could be affected. 65 to 85% of people have experienced TMJ dysfunction at some point in their lives with up to 12% requiring treatment. It is most prevalent between the ages of 20 to 40. It affects women more than men by a factor of 3:1. We each have a pair of temporomandibular joints. They are located at the sides of our head where the mandible (our bottom jaw bone) connects to our skull. The joint surfaces are lined by cartilage and between the bones is a fibrocartilaginous disc. The presence of the disc splits the joint into two sections, top and bottom. These two compartments of the joint allow for two different movements: rotation and translation. For example, during the first 25% of mouth opening, the mandibule condyle rotates forward and to achieve the rest of the opening movement, the condyle of the mandible starts to slide forward. Furthermore the disc is continuous with a retro-discal pad which can also be a potential source of pain. When working properly, our jaws are able to open and close, move forward and back, and side to side. The movement of our jaw requires synchronous and coordinated muscle activity of both our left and right TMJs in order to occur smoothly. Patient with TMJ dysfunction may complain of pain at the joint felt at rest or on activities like chewing or opening their mouths widely. Pain can refer to their face and down the jaw, even into the neck and shoulders. Other complaints may include headaches; joint noises (clicking, grating or popping); fullness in the ear; reduced range of movement involving one or both joints; and jaw locking. Additionally, they may notice diurnal variations such as joint stiffness in the mornings, or aching in the night. Issues of the TMJ may be caused by muscles, joint derangement or joint degeneration. Muscular causes: There is a strong correlation between neck dysfunction and jaw disability. Poor forward head posture is known to place abnormal stresses on the TMJ. Poor oral habits like chewing pencils, chewing gum or nail biting are non-functional repetitive movements that cause overuse of the muscles of the jaw. Teeth clenching/grinding of the teeth in the night can result in muscle spasms which cna also cause TMJ dysfunction. Derangement of the TMJ: Examples of joint derangement include a dislocated jaw from trauma, or a displacement of the disc which can cause pain and dysfunction. Articular damage: Wear and tear causing breakdown of joint cartilage can lead to arthritis over time. 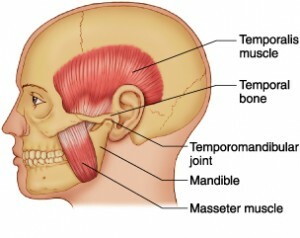 Depending on the underlying cause of your TMJ dysfunction, physiotherapists can provide treatments including modalities for pain relief, education about your problem and tips on activity modification, postural correction, manual mobilization of the joint, muscle stretching/release, and therapeutic exercises to restore proper joint mechanics. Placzek JD, Boyce DA. (2006) Orthopedic Physical Therapy Secrets, 2nd Edition. St. Louis Missouri: Elsevier. Dressendorfer R, Beale K (June 01, 2012) Temporomandibular Disorder, CINAHL Rehabilitation Guide, EBSCO Publishing (Ipswich, Massachusetts). ← Muscle Knots: What Are They and How To “Untie” Them?